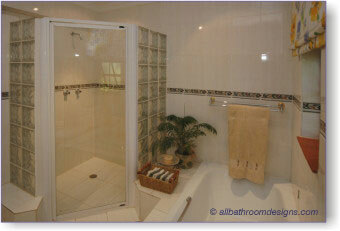 Your small bathroom remodeling project is your opportunity to enhance rather than just update the decor in your bathroom. You may be planning a small bathroom remodel because the fixtures and fittings are outdated or badly in need of repair, or because you are tired of the style of the bathroom. You're going to be making a mess and spending some money, so whilst you're at it - or even better, before you start - why not consider a couple of structural changes too. It will be worth your while in the long run! Could You Increase the Size of Your Small Bathroom? 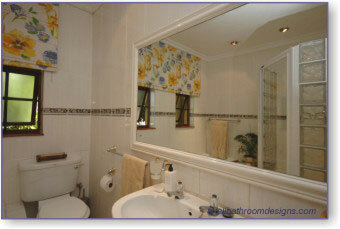 Looking at adjoining rooms with a new eye can open up possibilities for adding space to a cramped bathroom. When planning your bathroom layouts, perhaps a closet in a passage or hallway can be forfeited or space can be stolen from a laundry to add a few precious feet to a really small bathroom. In the small bathroom remodeling plan displayed here, we have done away with the adjoining guest toilet and incorporated it into the bathroom. Only minor structural changes are needed and it creates much needed storage space, his and hers basins and additional space for toweling off. The dividing wall between the toilet and basins need not be ceiling height either and can be in the same glass bricks as the shower enclosure (illustrated below), creating uniformity and light flow from the bathroom windows. Using glass bricks on two sides of the shower adds visual interest with the patterns of light it creates, whilst allowing ample light into the shower. A tiled enclosure would dominate the space and make the room seem cramped and a plain glass shower would not be as interesting. 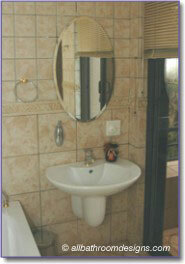 Wall mounted dispensers in the shower further avoid the clutter of shampoos and soaps dotted about. Note: If you want all the fixtures, (i.e. tub, basin, shower and toilet) but have limited space, you need to plan your bathroom layout carefully and then use some creative design ideas to make that space look generous. Your local building code will determine whether your space can in fact accommodate all the elements. However, there are so many products available on the market today to cater for a myriad of space saving requirements: a contemporary deep (smaller) soaking tub, wall mounted toilets and custom vanities. Adding natural light and selecting fixtures with a small footprint are two very effective ways to achieve this. Our page on Small Bathroom Ideas features practical and cost-effective bathroom designs for you to consider. A single large roman blind covers both windows, creating a larger sense of scale. Two separate blinds would have broken up that wall and make it look more cluttered. Hung from the ceiling, it also draws they eye upwards and adds a sense of height. An oversized mirror and floor to ceiling tiles all work towards creating a big canvas that is most effective in reflecting light and making the space look airy. Big tiles, especially, are great to make an area look larger.